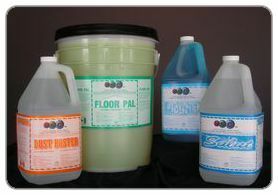 DUSTBUSTER: Mop treatment available in both water and oil bases. Both products contain quaternary compounds and are safe to use on all hard floors and waxed surfaces. VINEGAR: A 7% solution to be used as a floor neutralizer. GRIDLOCK: A high gloss finish at 25% solids. Specifically designed for all high speed burnishing. Excellent gloss and wear resistance. PLATINUM: A high gloss finish at 25% solids. Easily maintained with conventional buffers or high speed machines. MIRAGE: A high gloss finish at 25% solids. Easily maintained with either conventional buffers or high speed burnishers. PRISM: A high gloss finish at 18% solids. Ideal for applications requiring fast dry time. Responds well to burnishers. FAST COAT: A low solids (15%) full acrylic finish for those areas where time and cost are minimal. Responds well to spray buffing. Economical top coat for more expensive finishes prior to buffing or burnishing. THERMASEAL: Full acrylic, 22% solids, excellent initial gloss level. 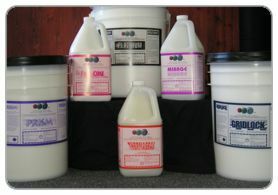 Ideal for all hard floor surfaces including concrete & asphalt. Not recommended for wood surfaces. All acrylics are formulated with "Tritex" materials and surpass industry standards for slip resistance, water & black marking, gloss levels, removability and durability. Coverage is dependent on user and type of floor surface. SPARKY: An anti-static treatment for carpets and upholstery. May be used in conjunction with "Stainmiser". Use full strength. Covers 500 sq. ft. per litre. 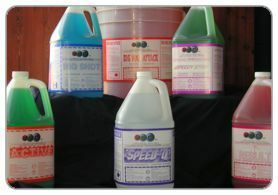 ACTIVE: A general purpose cleaner and degreaser for commercial kitchens (non food prep areas) (Mix 40:1).